Thursday October 13 was World Sight Day. It is the fourth year of the World Health Organisation (WHO)’s global action plan and the WHO affiliated International Agency for the Prevention of Blindness (IAPB) encourages its members and partners to continue with the rolling theme Universal Eye Health: A global action plan 2014 – 2019. This year, the ‘Call to Action’ for World Sight Day is Stronger Together. Vision 2020, a movement which works under Sri Lanka’s Health Ministry and does cataract operations free of charge for the needy people says that worldwide about 314 million people live with serious vision impairment. Of these, 37 million people are blind and 124 million have low vision. Also included, 153 million people are vision impaired due to uncorrected refractive errors (near-sightedness, far-sightedness or astigmatism). 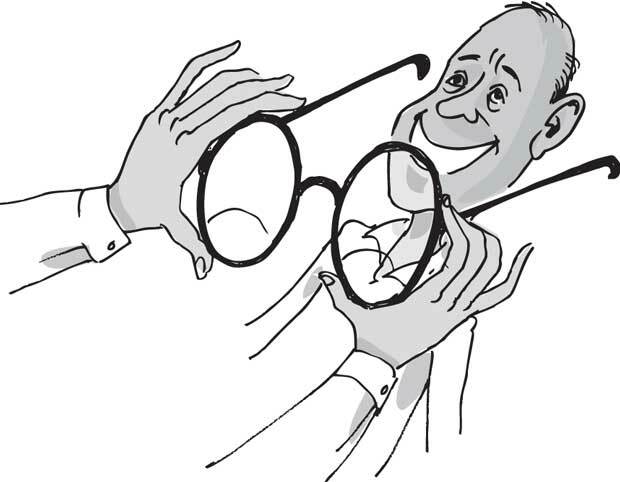 In most cases, normal vision could be restored with eyeglasses or contact lenses. Yet, 75% of blindness is avoidable, treatable and/or preventable, Vision 2020 says quoting the WHO. Some 90% of the blind people live in low-income countries. Restorations of sight, and blindness prevention strategies are among the most cost-effective interventions in health care. Infectious causes of blindness are decreasing as a result of public health interventions and socio-economic development. Ageing populations and lifestyle changes mean that chronic blinding conditions such as diabetic retinopathy are now rising. Women face a greater risk of vision loss than men. Without effective, major intervention, the number of blind people worldwide has been projected to increase to 76 million by 2020. Vision 2020, which is essentially the vision of the enlightened eye surgeon Dr. Asela Abeydeera, that in Sri Lanka, around 200,000 people are believed to be blind. Another 400,000 are having low vision. A majority of them have gone blind because of cataract. Refractive errors, glaucoma, diabetic retinopathy and blindness in children are the other causes of vision impairment. Vision 2020 says Sri Lanka’s population is rapidly ageing, therefore age related eye diseases like cataract, glaucoma and diabetic retinopathy are on the rise. Dr. Asela Abeydeera says the rising incidence of cataract blindness in Sri Lanka, is because many patients don’t undergo surgery due to the prohibitive costs of the artificial intra ocular lenses implanted in the eye following surgery. He says that out of 200,000 blind people, more than 70% are blind due to cataract and the numbers are expected to soar due to our rapidly ageing population. Cataract blindness is reversible. Surgery to remove the cataract is quick, simple and painless and is performed free in all government hospitals across the country. But the lenses have to be purchased from outside. Their prices vary from Rs. 20,000 to Rs. 30,000. Those unable to afford the cost, will eventually become blind and become a burden to society. Dr. Abeydeera says Vision 2020 has the mechanism to give patients these lenses for just Rs. 3,500. At present Vision 2020 distributes 10,000 lenses free to remote areas. It has appealed to the people to support this worthy cause. Cash donations could be sent to the Vision 2020 Secretariat, the Health Ministry, Deans Road, Maradana, and will be acknowledged. Dr. Abeydeera points out that although 80,000 cataract surgeries were performed in all leading government units every year, the number fell far short of the actual need. Every year an additional 20,000 new cases are added to the vast backlog of unoperated cases. Vision 2020 can reduce this backlog by increasing the number of surgeries-provided it has more trained staff, operating theatres, equipment and theatres. To mark World Sight Day, the Health Ministry says it is planning to launch many programmes to overcome eye diseases under the Vision 2020. It is intended to improve Eye Units, create Mobile Eye Units, provide contact lenses free of charge and conduct surgery clinics in remote areas. Health Services Director General Palitha Mahipala told a news conference that lenses would be provided free of charge within the next two months and not a single needy patient would need to buy lenses.